Pyckles Fashion Plates - Transmog Outfits for the Role Player Pyckles Fashion Plates : Let's Get Moggy With It! Terrible pun I know but I'm good at those. Since transmogging has be introduced to the game a whole new online community has sprung up, the Transmogger Bloggers. In fact quite a few sets of bloggers have banded together to set up contests for transmogrification, hosted on specific servers or via screenshot submission. These are your way to show off your truly unique set or just get new ideas for that hunter outfit you want to put together. 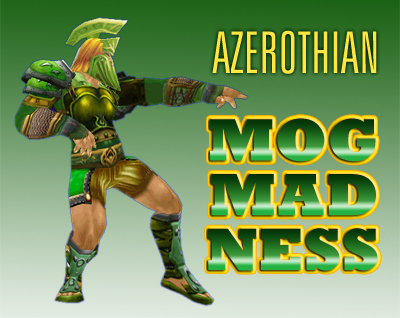 The WoW Factor is hosted by Keelhaul of Disenchanting Azeroth and Ironyca and Noelani from WoW Roleplay Gear (one of my personal favorite transmog sites). When someone contacts them with a request and a desire to host a show on their home server then the games, and the long preparation, begins! They actually provide in game gold prizes to the winners. I've been watching this one for a while, the creators put a LOT of work into this and it's amazing. This is definately one to keep an eye on and be ready to participate in if they come to your realm! I believe Keelhaul has since retired and Ironyca and Noelani have taken up the torch now. This was a short March only contest with five rounds. While it is now over, I'm posting it just in case Tome, Kenada and Effraeti decide to do another one. You can keep on eye them. I certainly enjoyed checking out the pictures of some of the outfits. They used a different twist by specifying outfits based off of a specific item or theme. "So Pyckles (you might ask) are you going to be doing any contests some time soon?" The answer would be most likely not. Although I do still have t-shirts left over from when I was manager of the WoW Vault. Think anyone would interested in a limited edition WotLK WoW Vault shirt? Eh? Maybe not...I most likely would get ahold of Ironyca and Noelani and ask about hosting a WoW Factor on my home server of Deathwing if I decided to do anything. What I would like to do is outfit of the month though! I love for people to see my outfits and you might feel the same. If you just want to share yours, send me a screenshot of your character and their armory link. If you want to add a little something about how long it took you farm your set, how many dungeons runs or how much gold you were crazy enough to pay for it, that would just add a little spice. Shoot me an email pyckles@pallydog.com.